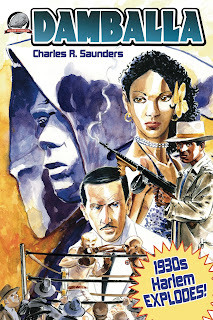 Airship 27 Productions is delighted to announce that the history making pulp adventure, DAMBALLA by Charles Saunders is now back in print and selling at a fair price on Amazon. Published several years ago, the book was the first ever pulp adventure to feature a black 1930s hero finally putting to rest the ignorant racism of the old pulps. The story takes place in Harlem, deals with a prize fight between a local hero and a Nazi German. It has interiors by Clayton Hinkle and a cover by Charles Fetherolf. Initially published by Airship 27 via Cornerstone Books, the print version quickly sold out and in the past few years has commanded prices in excess of $300 a copy, although the Kindle version has always been available. 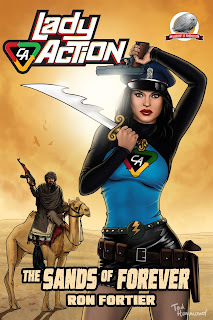 Airship 27 Productions, one of the leading publishers of New Pulp, is thrilled to be releasing the first ever prose novel featuring Lady Action, based on the character from the popular toy action figure line. When a top A.C.T.I.O.N. agent goes missing in the arid wastelands of the Libyan Desert, the super secret organization sends in their top field operative; Nicola Sinclair – Codename: Lady Action. An ancient power as old as the earth lies buried there and a wealthy Arab tycoon with ties to Islamic Terrorists groups will do anything to claim it. With only a few brave allies and her considerable skills, the lovely and deadly Lady Action must defeat this powerful villain and uncover the secret of the Sands of Forever or the civilized world is doomed to destruction. Combining the modern day flair of today’s spy thrillers with the pacing of new pulp adventures, Ron Fortier, writer of the Green Hornet, Terminator – Burning Earth, Captain Hazzard and Brother Bones : the Undead Avenger, brings to life one of the most charismatic new action heroes ever to dive into danger and suspense. The stunning cover is by Ted Hammond with design work by Pulp Factory Award winner, Rob Davis. As Retropreneurs, Captain Action Enterprises, LLC specializes in taking old properties and rejuvenating them for a new generation. Captain Action lives again in comic books, action figures, books, T-shirts, model kits and more. Additional properties include Lady Action, Captain Action Cat, Dr. Evil, Khem, Destiny Zero and Savage Beauty. For more information, please contact Ed Catto at ed.catto@bonfireagency.com. Now Available at Amazon.com in hardcopy and soon on Kindle.